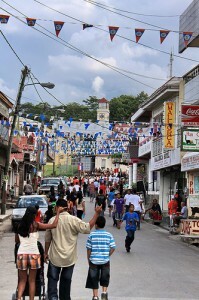 Christmas in Belize is a wonderful way to spend the holiday. Give your family the gift of an experience rather than another “thing” they don’t need. 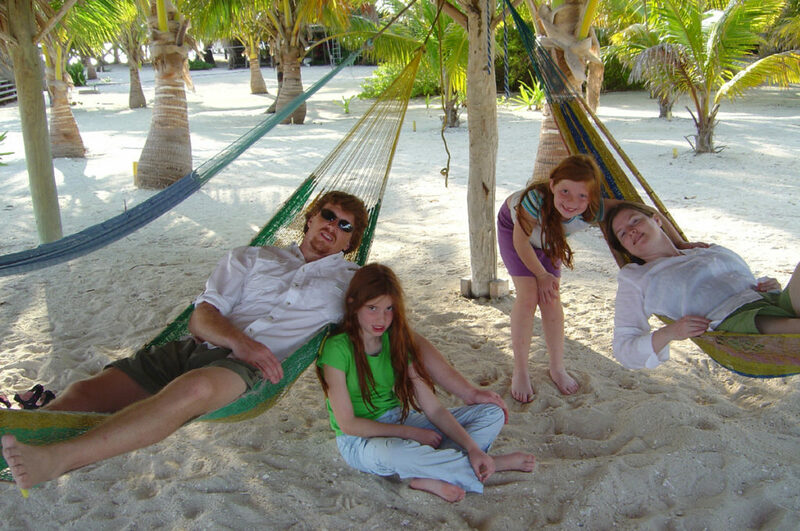 Your kids will remember a sojourn to our island at Glover’s Reef for their whole life, long after the new phone or new shoes are lost, worn out, or forgotten. If you want to go to Belize for Christmas, you need to start planning early! This means by May or June, but absolutely by September. After September most of the lodges in Belize are booked up. And even if you do find space in your 3rd or 4th choice, you will find that air seats are either all gone or prohibitively expensive. Every year we turn away hundreds of people for the trip date that includes Christmas, as these dates fill extremely early. This year is no exception. It doesn’t take long for our trip dates to fill because our island capacity is only about 34 guests at a time. However, we do still have room on the week both before and after this popular trip date. And the second of these options includes New Years Eve on the island! Below is a list of packages that still have room. Come join us this December for the best family holiday that you will reminisce about for years to come. Package includes 1 night in Belize City before the trip, 1 night in Belize City after the trip, and 7 nights on the island for sea kayaking, scuba diving, snorkeling, kitesurfing, windsurfing, surf kayaking, board surfing and fishing. Package includes 1 night in Belize City before the trip, 1 night in Belize City after the trip, and 4 nights on the island for sea kayaking, scuba diving, snorkeling, kitesurfing, windsurfing, surf kayaking, board surfing and fishing. Package includes 1 night in Belize City before the trip, 1 night in Belize City after the trip, and 3 nights on the island for sea kayaking, scuba diving, snorkeling, kitesurfing, windsurfing, surf kayaking, board surfing and fishing. Package includes 1 night at a beach lodge, 2 nights at a jungle lodge, and 1 night in Belize City – one in the middle of the trip and one on the last night, and 3 nights on our private island. In the jungle we go ziplining, waterfall rappelling, whitewater kayaking, underground kayaking, and exploring Mayan ruins, and on our private island we go sea kayaking, scuba diving, snorkeling, kitesurfing, windsurfing, surf kayaking, board surfing, and fishing. Package includes 1 night at a beach lodge, 2 nights at a jungle lodge and 1 night in Belize City. 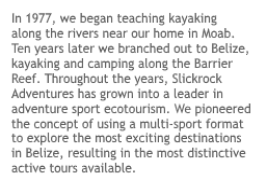 We go ziplining, waterfall rappelling, whitewater kayaking, underground kayaking, and exploring Mayan ruins. Belize Independence Day is September 21: a day marked by flag-raising ceremonies, parades, music, dance and food festivals held throughout the country. On behalf of President Obama and the people of the United States, I am delighted to send best wishes to the people of Belize as you celebrate 31 years of independence this September 21.Whether you are gathering with family, friends or loved ones, all Belizeans can rejoice in your nation’s great diversity of cultures, ethnicities, and languages and your proud heritage as a vibrant democracy situated at the crossroads of Latin America and the Caribbean. The ties between our two countries pre-date Belizean independence — the 50th anniversary this year of the Peace Corps’ presence in Belize offers us the opportunity to renew our longstanding commitment to community development, education, and youth empowerment. Together, we are working to promote citizen security, expand trade and economic growth, and build more opportunities for all people.As you celebrate this special day, know that the United States is a partner and friend. 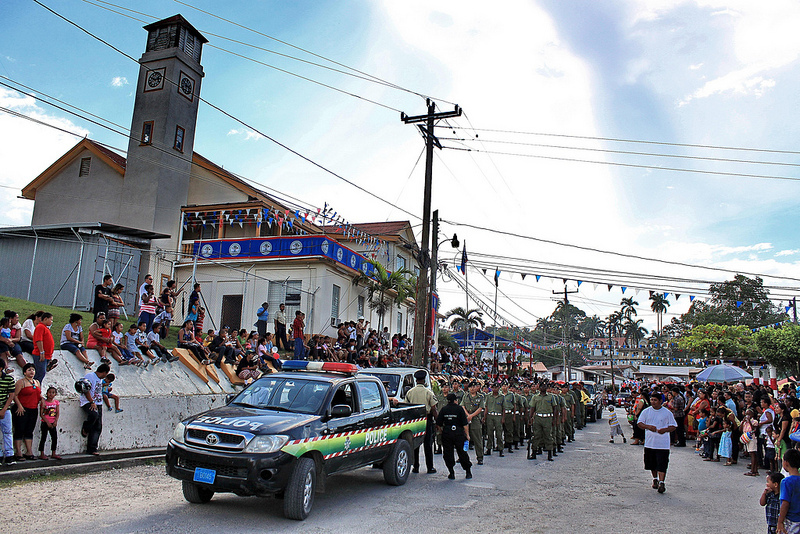 We will continue to stand with you in the years ahead to build a brighter future for the Belizean people. Belize, a country of only 8,867 square miles area and approximately 250,000 people gained independence through a several stage process that began in 1954. Traditional events that have constituted the September Celebrations include the Queen of the Bay Pageant, Carnival Parade, St. George’s Caye Day Citizens Parade, Expo, Official Independence Day Celebrations, and live musical concerts. New events will include the Cultural Explosion, Belize Sound Fest 2007, 26 years of dance, children talent parade, and “we are Belize”- in music. This year’s Belize Independence Day theme, “Independent, Strong and Free, Belize Fi All Ah We” was submitted by fourteen year old E.P. Yorke Highschool student Esther Humes. The phrase is creole (the language spoken throughout Belize) and means – Belize For All of Us. The teenager was awarded a thousand dollar cash prize for her effort.